We caught up with Rich Powers, of University of California Office of the President (UCOP) to find out how ICAMP enables visibility and integration across campus systems, and promotes efficient asset lifecycle management, too. It’s also a huge step up from the array of disparate systems that they previously used to manage capital planning and asset management across the university. 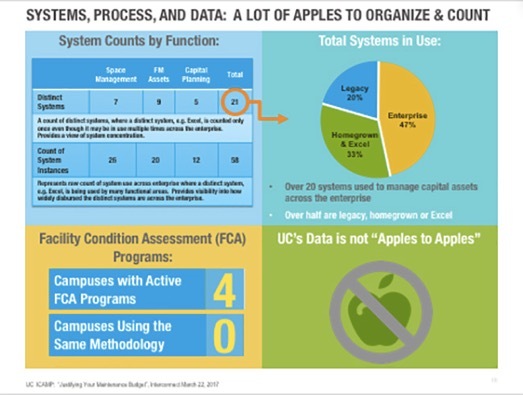 Prior to ICAMP, UC employed as many as 20 or 30 distinct systems – including legacy mainframe systems and excel spreadsheets. This meant that asset data was bound up in multiple systems, which also meant no clear point of reference. Compounding the problem was a lack of standardization across reporting methodology and asset component terminology. Understanding the condition and performance of the university campus buildings was like painting an apple using the description of an orange. This lack of comparative data made it very difficult to identify high-risk assets. It was also difficult to prioritize deferred maintenance and facility renewal needs. That’s why they needed ICAMP. The goal was to create a single, integrated system that will enable UC to understand the condition of each of its assets. This in turn means UC can identify risk factors, prioritize maintenance needs and create accurate cost projections for renewals and future maintenance. UCOP choose the IBM TRIRIGA platform to bring together all their asset data into one integrated system. TRIRIGA lets you create a building inventory and location hierarchy. It also has the capabilities required to manage those buildings throughout their lifecycle. Crucially, it supports facility condition assessment, or FCA. This how they access every building component – from floor to ceiling – for health and performance. Using TRIRIGA, Rich and his team can overlay their building inventory with the FCA data to understand which assets are most at risk, or in need of maintenance. By combining this information with industry data from RSMeans, the ICAMP team is able to estimate potential repair costs, then kick off opportunities from within TRIRIGA. 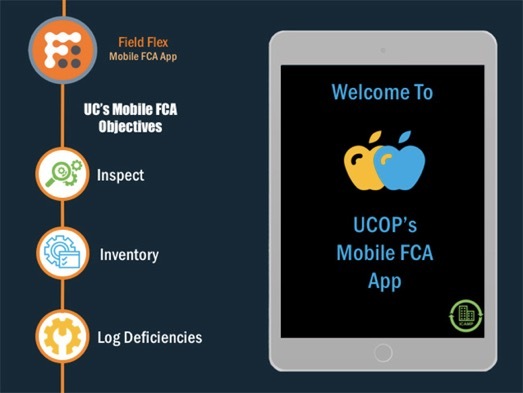 UCOP also built a mobile FCA application with FieldFLEX Mobile that makes TRIRIGA available to technicians in the field. This carries the advantage of a streamlined inspection and assessment process. And it allows architectural, electrical and mechanical inspectors to look at their respective inventory elements and access asset data with ease. Since its inception in 2011 and going ‘live’ in January 2018, ICAMP has made big strides. The program has been implemented in five of the 10 campuses, with plans to cover the remaining ones over the next few years. One of the biggest benefits: coping with deferred maintenance and risk. Budget constraints are a reality for most. And when you don’t have a clear picture of building conditions, it’s hard to know what to prioritize. Now, however, ICAMP is developing a system-wide portfolio view of the assets. This will enable them to understand UC’s deferred maintenance backlog and renewal obligations for the future. This complete inventory allows UCOP to clearly see which assets are at the most risk due to unmet maintenance needs, and prioritize work accordingly. To ensure that decisions are data-driven, the ICAMP team is assigning a mission/risk score to assets. This helps the team to identify those elements that are most critical to a building and to the mission within that building. For example, a mission-critical risk for UC is anything that has a clear impact on education, research and public services like hospitals and patient care. The FCA condition assessment looks at both the likelihood of asset failure, and the consequences of that failure, then combines the score for both factors to come up with an overall risk score. UCOP can use that score to make decisions around how to best allocate precious resources. Once the program is rolled out to all UC campuses, the next stage is to optimize building operations and lifecycle management. Rich and his team hope to incorporate Facilities Condition Assessment into everyday operations for asset management. By actively monitoring the condition of their assets, they’ll be able to better allocate resources and funds and proactively maintain asset health. The partnership between UC and IBM extends beyond ICAMP. Currently, they’re also working together on the new UCSF Precision Cancer Medicine Building, an addition to the Mission Bay Hospital. There, PCMB will integrate clinical and research teams to leverage discoveries and collaborate across tumor-based programs. It’s a noble mission and, unlike more traditional construction projects, the team didn’t begin with architectural designs. Instead, they started with data. Find out how IBM TRIRIGA can increase the operational, financial and environmental performance of your facilities and property assets.